Brand New WoSign’s Official Website (www.wosign.com) is Launched-WoSign SSL Certificates! After several months of elaborate planning and designing, the official website of WoSign is launched today. This brand new version of WoSign’s official website reserves the main structure and function of the old version and makes up for its deficiency by optimizing the menu navigation, content structure, design style and other respects, which make it easier and more convenient for users to gain access to WoSign product information, technology knowledge, application guide and other important contents. The combination of navigation bar, pull-down menu and the navigation bar on the right side have made it possible for users to find the information they need in any page under the guide of navigation. The original left-sided navigation bar has been moved to the right side, which conforms to the practice and habit of user’s. There is relatively great adjustment to the content of homepage section. Products that are large in demand are set with visualized entry on homepage. Application cases and service commitment of regular customers are listed to users. The newly-added bottom navigation makes it more convenient for the users to get to the content pages directly from homepage. The new version of official website has continued the simple and fresh style of the old one. At the same time, it keeps up with the design trend and makes the interface clean and uncluttered by applying the flat UI design and getting rid of redundant decorative effects. The visual experience of the website becomes more comfortable and concise when reconfiguration of font, font size and color blending has been carried through in accordance with the visual needs of large-size screen period. Revision of official website is an important embodiment of an enterprise with upgraded brand and boosted sales. There are sustained growth and steady increase of market share and influence in the industry while WoSign keeps expanding its business in the last few years. As the main front online, the revision of official website is imperative. 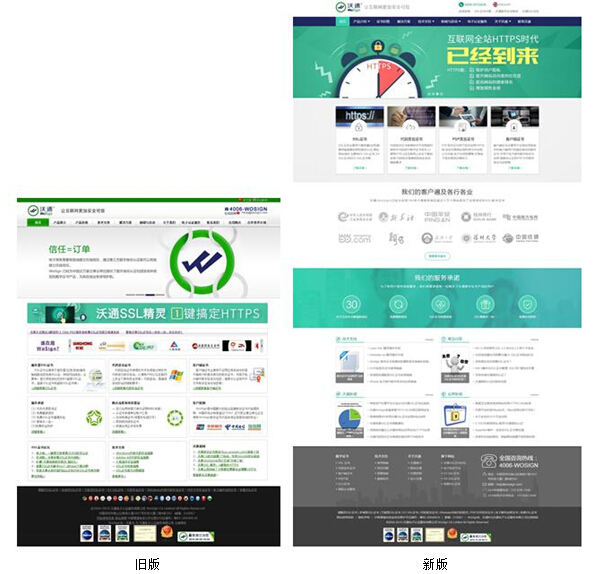 We hope that new version of official website can provide more convenience for users. Your valuable advice and suggestion are welcomed.